Before the final rinse. See all the grapey goodness? So, my dear husband arrived with a bucket full of wild grapes. He squished them to make bottles of grape juice with a distinct, not unpleasing wild and musky flavor (after adding a bunch of sugar). There was still quite a lot left, and he asked if I wanted to use some to dye some yarn. I looked up a bunch of information online, squished it together much like the grape juice, and jumped in! Find natural yarn in stash. I used 4 hanks of lovely wool, all different kinds, from Cascade 220 to local fibers in specific sheep breeds, and one unlabeled surprise. It ended up being about 18 oz of yarn. In the above picture, the yarns are (from left to right) from Wisconsin Highlands Farms (bought at the Madison Farmer’s Market), White Dog Farm Lincoln Longwool Lamb sportweight (from Forestville, WI), Cascade 220 100% Peruvian Highland Wool, and an unlabeled yarn that looks similar to the first one. Mix up a mordant. I used 1.3 oz of alum (various online instructions suggested up to 10% of dry weight of yarn, and that too much makes the wool rough, so that’s how I chose 1.3 oz) in enough filtered water to cover the yarn. I filtered the water because our well water has heavy amounts of iron and can make anything orange. Orange and purple don’t mix well. So, bring the mix to a boil, place yarn in water, and remove from heat. Let yarn sit in mixture for an hour as it cools. Prepare dye. Mash up the grapes. Add water (2 parts water to 1 part substance is the advice I read). Bring to a boil for 1 hour. Let cool a bit, and filter out the solid bits. Add yarn to the liquid. Let sit overnight. In the morning, I decided to try a citric acid soak to help set the dye. 3 teaspoons citric acid to 12 cups water, dissolved. I rinsed the yarn in tepid water (not as thoroughly as I should have… a LOT of color came out!) and soaked the yarn in the mixture for about 30 minutes (10 probably would have been enough, but I was distracted). Squeeze each hank out, wrap in a burrito of plastic wrap, and microwave 1 min, twice. Each hank done separately. After my incomplete rinse out of the dye, but also a citric acid soak. Then I placed all the yarn out in the yard to dry. I am amazed by the different colors! One is a light pink, one a dusty gray-purple, one more of a purple-ish pink, and one has features of purple that I would call grape. A big surprise! As I write this, the yarns are out drying. However, I am thinking that I didn’t rinse the dye out well enough. I might go out with a bucket and some wool wash and see if I can get them to the point at which they no longer drip colors. I don’t want any surprises when I use this yarn to make something! In the last picture, I believe the Left furthest is the Cascade 220, which was really the one to take the dye the least, and looked pale pink right from the beginning. The next one is likely the unlabeled one, the third is from Wisconsin Highland Farms, and the right end is the White Dog Farm wool, which was more cream than white, and took on a gray-purple cast. The color isn’t fully accurate in the last picture, either. The colors have more pinks and magentas in them, although they are certainly more pastel than I had expected. I like them, still, and am happy I got to experiment with dying, and didn’t have to use harsh chemicals. Next time I get an urge, I think I will try the Kool-Aid dye strategy! Life is full of hard, hard days. Slogs of boredom, pain, struggling, screwing up. I am not here to talk about those days. I am here to talk about the good days. The days where you feel connected, thrillingly alive, hopeful, forgiving, and happy. I had one of those days lately, and it is a bit knitting related, so I thought I'd talk about it. I have written a few posts here that I'm pretty proud of. I shared my knitting excitement, my love of yarn, but more than that, I've shared about my life. And especially, how the focus on knitting, the creativity, the moving of the hands helped me during my dark days of grief and loss. The post Vincent and the Doctor was an important one for me. Knitting was there with me, for me, as I created and learned and kept trying even when I didn't want to get out of bed. So, I have continued, but haven't blogged as much. I've gotten back to full time work (4 days a week at least), and family activities have expanded as the kids have grown. They are 9 and 12 now, and my oldest son is off at summer camp right now! oh, my heart. But, another big change is that I opened my heart to a wonderful man, slowly, not always gracefully either. And this past Memorial Day weekend, we got married. And the knitting related part? I made my dress! Here's the Ravelry page for My Wedding Dress. I used the lovely Maddie dress pattern from Kari-Helene Rane. It started with over 600 stitches cast on at the bottom of the skirt. I was using a lovely wool and silk blend and decided to add one row of a contrast color at the bottom of the skirt, the neckline, the edges of the sleeves. I was into the lace pattern (over 600 stitches a row!) about an inch when I noticed that I twisted my join. Knitters, you know. Oh. So, I did what I needed to do. It was 2 months until the wedding. I turned the stitches around the needle to make a little … oh... let's call it a pleat?... and kept on going. It was a good choice, because I knew I had already built in my small flaw, my reminder that we can't control it all, that we are infallible and human, and sometimes that is good enough, too. If you click on the link for the dress, you can see there were more challenges along the way. To briefly summarize it, I was knitting with dk weight on a pattern made for sport weight yarn, and my gauge failed to live up to my swatch. I ripped back many inches twice, got out the calculator, and figured it out. I had made the sleeves in a bigger size than the dress. I worried and just decided that I had to let it go: the wedding would be great because I had friends and family and love, and that was fine. Everyone knew the dress was made by a crazed bride planning the whole shindig, and they would be understanding! However, in retrospect, I was kind of hard on myself. I've been knitting for a while now. I teach knitting. I know a lot. And the dress turned out custom fit for the bride, with handmade details and love. It was done over, and pieced together in a way that fit. In a way that looked and felt good. In a way that I hope lasts a lifetime. I might no longer be talking about the dress. So, now there is Michael, and me, and the boys. And a lifetime of piecing it together, doing it over when we mess up, making it work, and lots and lots of love. In knitting, sometimes it is very hard to see the whole picture. You have an idea, you might even see a picture of what someone else made. But your yarn is different, your tension is different, your very movement, heartbeat, and breathe will influence the finished object to make it uniquely your own. Although this sounds abstract, it is absolutely practical and real. For example, a person who pauses to pull the yarn tight with each stitch may fit 6 stitches in an inch of knitting. My loose looping might give me only 5. If the pattern calls for knitting 200 stitches around a sweater, that 6 stitch an inch makes the sweater around 33 inches around, a women's size small. My 5 stitches an inch will make a sweater 40 inches around, a women's large. A huge different from one stitch each inch, a ripple from a dropped rock becoming a wave. To get an idea of the whole picture, you swatch, make a sample, a trial run. If that isn't what you want, it's much less painful to rip that out and try again than it is to rip out half a sweater. So, to make the knitting fit, you can change things, the size of needles, even the kind of needle (wood or metal or acrylic), maybe even the size of yarn. You can think outside the box, and knit a size small with your loose knitting style to get a size large because you've adapted for your known style. The key is to remember there are options, to know your style, to try a sample, to adapt to make things the way you want. There are surprises. Even with all this, swatching and planning, things can happen that make the result ... different. For example, the knitting can happen when you are anxious and worried, and your normal loose loops have turned into cramped and tortured knots. Or, the fabric looks great, until it is washed and laid flat to dry with the respect earned by good wool. And that good wool grows 3 inches, bringing to mind sheep with long braids in the rain. The unexpected is not a disaster. If committing to a sweater's worth of knitting time, one may now learn to swatch and then wash the swatch, too. One may decided to knit only a small cloth in the doctor's waiting room with worry keeping company, instead of a sleeve that no arm will later fit through. One learns. One hides the braided sheep's sweater at the bottom of the bin. Maybe, in a spurt of thrift and resilience, one rips out the old and reuses the yarn more appropriately. Sometimes, yarn knows what it should be, and it is wise not to argue. The whole picture seems to be made up of lots of little bits of wisdom, made more beautiful from the learning. And more often, I admit, I don't swatch, I just start. The yarn, the colors, the movement seduce me and I am off, creating and going and hoping for the best. All the bits of wisdom not forgotten exactly, just tucked away, useful still. And sometimes, I get lucky and the unexpected is a pleasant surprise. May your yarn be soft and happy, may your fingers be limber, and your heart brave. Onward. This Friday and Saturday from 10 to 4, I'll be at my booth in the Sister Bay Village Hall. It's a wonderful art fair, with local artists offering pottery, jewelry, soaps, mittens, hand-dyed yarn, paper art boxes and journals, and more. Every year, there are treasure to buy for the holidays. As the chill of Autumn starts in the air, and the eager leaves are bronzing (hey, for knitters, this is a GOOD thing! ), I receive a gift, an opportunity to be part of a show at the Meadows Art Gallery. This is a special place, where artwork is displayed in wonderful layouts highlighted by exacting lighting. The art shows rotate every 6-8 weeks, and the artists get to represent their work at cheerful receptions. The Gallery Curator is Tom Seagard, a man I've known since I was a kid, who has passion and enthusiasm for every medium out there. He's graciously included me, in the belief that knitting is art, and for that I am thankful. I will have between 10 and 12 pieces there, along with seven other artists. Many works will be offered for sale, although some may simply be on display. There is a theme of "The Old Guard" and "The New Guard," of which I will be included with the latter. I'm excited and honored to have such an opportunity again. Many people in the community come to the reception, and many will wander through over the course of the show, and it's rewarding to have people comment on and purchase my creations! This show will be there from September 3rd to the end of the month. Spruce Hat and Mittens, finished at Sister Bay beach on the first of August, 2017. Photo by a wet kid. I've been working on some things to sell, some things that are complicated and pretty, and some things that are labors of love. There are pumpkin hats for babies (even some raspberry and cherry colors, too). I designed and made a scarf in brilliant shades of yellows and orange; of course, had to be called the Vitamin C Scarf. I made a Tumbling Blocks hat, which is really a fun optical illusion in colorwork. There might be an Icelandic Sweater on display if the one I made it for will let it be there! It does get chilly in the evenings in Wisconsin, and he might want to wear it. Icelandic Sweater for a Handsome Man. Very happy with the fit. So after this show, it's deep into holiday knitting, when I sell the most as people look for special gifts. Knitwear is wonderful in the winter! And, I do have a pattern I've designed that I plan to sell, as well. That's exciting for me, and I hope other knitters will be excited, too. It's a colorwork hat with a wave and water theme. I hope to have that ready in September. So, that's what is new with my knitting. An exciting and busy season coming up! Thanks for reading! I have been continuing to knit, and have been trying some new things. There is so much to try and to explore in the world of knitting. Getting bored will not be a problem! Speaking of learning, I took a bunch of pictures of my knitting in a light box today. Wow, did that make a difference! It's a great way to take pictures of things to sell, with diffuse light and no distractions. And, speaking of learning, I am thinking I would like to more formally teach knitting. I love it so, and am developing an idea about a good way to introduce people to it, casting on, knitting, tinking, purling, casting off... I think it will work. So, overall, the kids are busy, I am busy and working more, and knitting is engrossing, challenging, and a great stress relief for dealing with the rest. Just checking in. And finding there is a lot to look forward to. Here's to good things ahead! June 25th at Top of the Hill Shops, these are some of the things that will be for sale! So, The Goddess Door is officially an LLC now! That doesn't mean I will leave my main job as a physical therapist (which I love, and will have to write more about sometime). It also doesn't mean I have figured out how to make a profit selling knitwear, even the really gorgeous stuff. It means that I am going to sell my things at an event, and I want to pay taxes (as I should) on stuff I sell. I have been partnering up with others who collect and pay the taxes for us both, but I figured it was about time I make the leap. And, maybe, someday, I will learn how to make some money with this thing that I love to do. I suspect that might involve writing and selling patterns, which I find pretty exciting! So, I am all set up to move ahead, if that is how things proceed. The kids and I are doing pretty good. This is the first week of their summer break, and they are deep into Vacation Bible School, Camp Cool, soccer, and piano lessons. We have canoeing, camping, kayaking, sailing, and zip-lining planned over the summer. I can knit during only some of those things! I haven't blogged in quite a while. The Vincent and the Doctor post was very meaningful for me, and I almost felt like... well, what do you say after that? I still think of Don often, I still miss him terribly, and I work to keep his memory alive for his sons. And I am also continuing to live, love, and create. So, I will try to write a bit more often. There are really fun yarn and knitting ideas percolating in my brain! June 25th - Our 1st ever "Partying With The Pirates" bash at the Top Of The Hill Shops in Fish Creek - Their will be various crafters and a lot of great shops to find just the Door County souvenir or gift you've dreamed of. We'll be serving our famous Cheeseburgers in Paradise AND some great craft beers from Door County Brewing Company for consumption in our beer garden for those of legal age. Profits from this event will be for the 4 food pantries in Door County. Warning: there might be some Doctor Who spoilers in here. Not for the new episodes, of course (I wish! ), but better to be forewarned if you are slowly working your way through the episodes. and I questioned, "and who said that?" "the 10th Doctor, David Tennant"
Parenting Win!! I actually think I may have pumped my fist in the air. Hehe. The reason I am bringing this up in my knitting blog? Well, we've been watching from Series 1, in order, only skipping a few that were extra scary. I asked the other day if we could skip ahead to my favorite episode, with the 11th doctor and Amy, called "Vincent and the Doctor." The kids said sure, so we watched it. The part that I like the best is when they take Van Gogh forward in time to learn the lasting influence that his life and art has had on the world. The curator at the museum explains his view of Van Gogh's art, and how Van Gogh portrayed life in ways ... well, I think another quote is needed here. The Doctor: Between you and me, in a hundred words, where do you think Van Gogh rates in the history of art? We watched that on the six month anniversary of Don's death. And I thought of the lasting influence of an incredible life, a quiet and ordinary life, a precious life. The best part of that episode is the possibility of knowing, before you are gone, all the influence and importance of your ordinary life. Don watched that episode on his Kindle one of the days he was getting chemo. I was sitting with him, knitting and listening to the episode as he watched. He cried, of course; he was very sentimental that way. I hope he had just an inkling, maybe just an idea, of how very much he was loved. So, I had ordered some lovely yarn, pictured at the top of the blog, a few months ago. I was wondering what to do with it. After watching the show, I had a vision. I dug around in stitch dictionaries, and found an idea. I modified and played with it, and wrote out my own directions, and started the shawl you see in the picture. I am really happy with the way the colors and stitches are playing out, reminding me of Van Gogh's Starry Night. I probably won't sell this one. But if you see me wearing it, come and admire the colors, the swirl of the fabric, the softness and drape of the knitting. I will wear it to celebrate that extraordinary, ordinary life that changed our lives forever. Vincent Van Gogh: [Explaining how he sees the world] Look at the sky. It’s not dark and black and without character. The black is, in fact deep blue. And over there: lighter blue and blowing through the blues and blackness the winds swirling through the air and then shining, burning, bursting through: the stars! Learning new things, being creative and challenging yourself is one of the greatest joys in life. In knitting, this means trying a new technique (Fish Lip Kiss Heel: it's a thing! ), or yarn or even style of knitting. Try textured stitches, or mosaic knitting, or stranded color work. Knit with cotton or linen or even plastic. Knit Continental, English, or Peruvian! Add beads. make lace, and if you really want a new challenge, you can even knit backwards. This is great fun, and many people have spent lifetimes enjoying the depth of knowledge to be explored in the fiber arts. However, there does come a time, as when making socks, when the knitter is denied that pleasure. When the first sock is done, and you ... have to do... the exact. same. thing. again. Working on the first sock. Ah, simpler times. Handmade socks are the bomb, but it takes time. Time you have to spend repeating what you just did, and not trying that unusual Celtic knot scarf you have your eye on. For example. This problem is not mine alone, and it's called Second Sock Syndrome. We recently had the opportunity to travel, and I brought socks to work on. Socks are good travel knitting; they don't take up much space and you can spend lots of pleasurable knitting time on that sock. That one sock. So, perseverance! 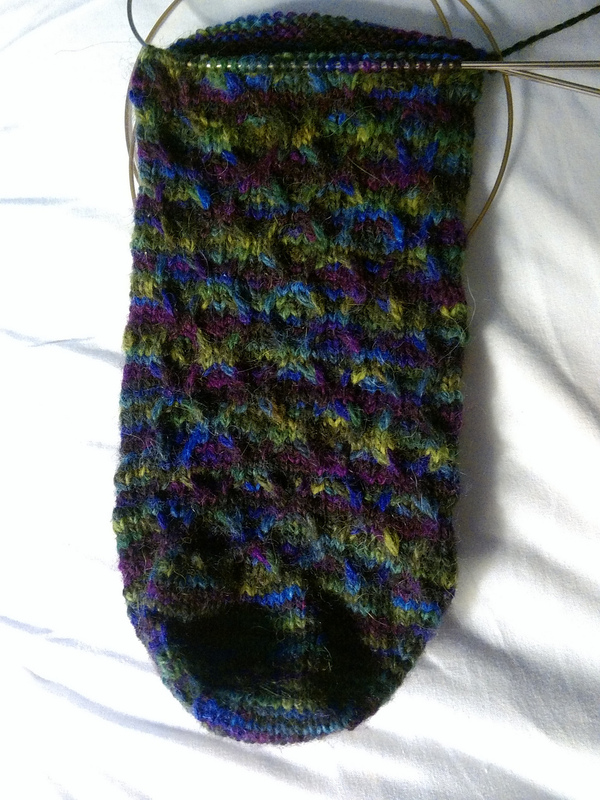 I finished the rainbow sock, in the Jaywalker pattern, and I have even started on the second. The purple and blue sock only got as far as the last picture; it's in the Starflower pattern. It's washed and blocking to dry; just need to sew buttons on in the next few days. So, still trying new things and having fun! And eventually, probably, will finish those socks. I've been working on several custom orders the last few months. Oh, the Fair that I wrote about in my previous post was a grand success, and my inventory is low! What a problem to have! I really haven't been able to knit as much the past few months, either, but mainly that is also a very good thing. When I'm not at work, I've been meeting friends for lunch, walking in the woods, starting to run again, and taking the kids on adventures (we tried ice skating and went to a barn dance). The connections and caring from my friends and neighbors in Door County has been tremendous. Most days I am happy. That's surprising to me, but I'm very grateful for it. My blog is brief tonight; the kids want to play a board game. But I am still here, still knitting in the quiet hours, and planning for some wonderful new creations to come! One day at a time. I've been busy with the kids, celebrating a 9th birthday, getting back into after-school activities, and getting myself back to work. I've also gotten back into knitting, to relax, to occupy my hands, to make things that I love. Grief comes in waves, and I know there are times when I just pretend it didn't happen. Coping. There is a lot of good left in the world, so much of it in these wonderful kids. It's very hard to see how much they miss their Papa, but they are so busy with friends, tormenting each other, playing video games, learning baseball, learning to read, dance class, Sunday school, getting sick, getting better, learning to handle emotions... if I had been at all worried I would stay in a fetal position under the covers, I now know that isn't an option! At least not all the time. cough. So, my knitting thing to look forward to is the Holiday Fair the Friday and Saturday of Thanksgiving weekend. It's at the Village Hall in Sister Bay, and my mom and I will have a table! I will have all my things there, and I am pretty excited. I've made a few more hats to sell at the Fair (it benefits Friends of Gibraltar, and is sometimes called the FoG Fair). She has gorgeous hand made boxes using beautiful fine papers and paper that she's marbled. It is fun to create. See that Meditation in Motion idea. I do love knitting. Sometimes something wonderful falls apart. The worst happens. It doesn’t seem fair or right or kind. Not really talking about knitting this time. A photo taken a few weeks ago. My wonderful husband of 10 years died last Monday. It’s hard to know what to say, it’s so awful. And I feel a strange combination of raw and numb. All I know is the world feels wrong. I loved him tremendously and I want him to be with me. The kids are sad, I am sad. The Memorial is tomorrow, and I feel like I’m in a nightmare that won’t end. I’m using Barbara Walker’s top-down knitting book to design a sweater. It’s the softest and gentlest Alpaca you can imagine. It will hug me and keep me warm. I don’t really know how to repair knitting very well. When there’s a hole, when something is torn away. Maybe I will learn how to patch things enough to keep going. Maybe someday I can imagine things whole. When you buy something from me, you're helping support my family. Thank you. This is a paraphrase from a recent Just One More Row podcast. I listened to it while walking with the dog on a hot and humid day, and this phrase really resonated with me. Even though my Etsy sales have been nothing to write home about (although thank you for the hats you bought, Sara!! ), I've been doing a fair amount of custom request knitting, and it has been so fun. It's been fun to make things in colors that someone picks, out of the perfect fabric, and to practice creativity and challenge my skills. It also has been very touching because I know that several people are asking me to knit in order to help us out. I haven't blogged in a while. It's been hard to separate my private life from my knitting life, and it's near impossible to know what to say about how things are right now. I want this blog to be something fun, about knitting and part of my distraction / coping mechanism. But the real life issues are just too much to ignore. My husband has cancer. It's spread from his leg to his groin, to his abdomen, and most recently to his lungs and his spine. Things are very scary right now. But I want to write about how knitting and this community is helping us get through this. My previous post on meditation in motion is very true for me. Knitting calms me down when I am going nuts, waiting in doctor offices, worrying. I even walk and knit! I get a lot made, and keep my fingers and my mind busy. Even more than that, I've learned how caring and wonderful so many people around me are. We are blessings to each other. Parents of my kids' friends have offered to entertain and help with kid transport, we've been gifted with food and funds and prayers, and our church family is supporting us with a concert and silent auction (I have some knitting there, too!) . So, even though it seems so strange, I feel absolutely lucky. Our tragedy unfolds, but there is still love, there is still good, there will be a tomorrow, and we are not alone. Well, damn it, now I made myself cry. Good thing I have a strong suspicion that my mom is the only one that reads my blog! haha! Okay, here's something fun I've been working on: LEG WARMERS! Yes, seriously! Dancing on the Door is a new dance studio opening in Egg Harbor, WI. The owner, Andria, asked if I would be interested in selling some of my knitting there. Yahoo! Leg warmers for little and big dancers! I am so stoked. The first pair I've made is SPARKLY. Oh Yes. Next, I'm working on some fuchsia lacy leg warmers and/or boot toppers. It will take a good few weeks, but I think I should have about 5 pairs for sale pretty soon. Here's a fun article on how to wear leg warmers. You know you want to. And as my items expire on Etsy, I think I will look for a local vendor to connect with... Spot in Sister Bay (link opens to their Facebook site) has already stocked hats (so don't need my cool hats, even though THEY ARE SO COOL), but might be interested in some wool house socks, which I could work on. Or maybe another shop would be interested in soft and wonderful winter hats. I will keep looking. And if you have read my blog, thank you. Day by day, with knitting needles in hand! The relaxation response is a powerful one, able to alter our body chemistry and structure. It can enhance our ability to cope with stress, illness, financial woes, jerks in traffic.. ahem. Any of that. I've done some guided imagery, yoga, meditations over the years, but none of those things stuck with me as a daily practice. It wasn't until I started running that I really learned what kind of meditation works for me. It involves repetitive motion. I think, or calmly don't think, when I am in focus and moving. Sometimes it feels like FLOW, like a musician playing their instrument, like a child being rocked to sleep, like a great song with a rhythm that thumps with your heartbeat. And everything else is gone, just the quiet footfalls or needle clicks to focus on. And then the counting. First Door County Half Marathon, an amazing race. I started counting footfalls when I focused on cadence with my running: how many times did my left foot hit the ground in 30 seconds? and can I increase that number to shorten my stride length? It reminds me of counting to 10 when you are upset; counting alone is calming, but counting and moving gives a real boost to the relaxation response. In knitting, there's not always a lot of counting, but sometimes there is: 1 knit, 2 knit, 1 purl, 2 purl, and slip. Just like watching the kids' dance class! (Well, I don't thing they try to slip.) But over and over, the meditation is deep, with focus on each stitch and the dance of the loops, around and around. And what is that relaxation response? It's the opposite of the fight or flight response. Think of a big adreneline rush: heart rate jumps, muscles clench, palms sweat. And in your body, hormones are released, the immune response is suppressed, the ability to digest is inhibited. Oh, you've seen those stupid "stress = a big belly" commercials, ugh. But, yeah. The relaxation response is when your heart rate slows, your muscles become less tense, your hands are warmer. And people who are able to achieve this relaxation response regularly seem to have less inflammation in their bodies, and stronger immune systems. This journal article is an interesting summary, if you are interested in more. So knit, dance, run, breathe, for your health and for fun, and to make good things. I used to think I didn't like wool. I pictured a scratchy and stiff wool sweater against my bare skin, and shuddered. That's before I found out two things: 1) there are many kinds of wool, some very soft and pliable and 2) wool is amazing! Wool is a breathable fabric, providing light insulation for warmth in the winter and to help keep you cool in warmer temperatures. It can absorb up to 30% of it's weight in moisture without feeling wet (ever sweated in a cotton t-shirt? blech). I've worn a wool sweater I made for myself on rainy days, and dashing into the store and back out through the rain results in no heaviness, no chill from damp, just comfortable warmth. If you've bought synthetic exercise clothes, after a while you've learned about the dreaded stink problem. The synthetic fibers hold onto sweaty odors even after washing. Wool does the opposite. Because of the nature of the crimp in the fibers, dirt stays on the surface and odors don't penetrate. Never use strong soaps or bleach on wool, because that will make the fibers stiff and you lose some of wool's magic. Gentle detergents will wash away any dirt and keep some of the oils that make wool so soft and water repellent. Wool is also naturally fire retardant. Wool is renewable and doesn't require killing an animal. Wool is naturally resistant to mold and mildew. It also doesn't collect static, which means less dust and allergens in the fabric. These were in the dryer until they had shrunk to the right size, then brought out to air dry the rest of the way. I placed bags with rice inside to shape them, because they stay very much in the shape they are pulled and stretched into when drying. When one is knitting, wool is the bomb. It has a little stretch to it, and is comfortable to your hands. After knitting with 100% cotton or linen (no stretch at all! ), you appreciate the softness and comfort of wool even more! And acrylic yarn feels all plasticy, a bit like the plastic coated rope used to make clothesline. It is fine in its place, but for anything next to the skin, I'd prefer at least some wool content. What about a wool allergy? From my reading online (i.e. not a wool allergy expert here), it sounds like the lanolin in the wool can cause an allergy, which is fairly rare. Those people would also be allergic to lotions and makeup with lanolin in them. Many people who say they have a wool allergy have had an itchy sweater experience instead. Maybe some fine merino would be in order? Some people do develop a rash and hives and all that, so I don't mean to discount a real problem, but again, it's fairly rare. And there are superwash wools out there. 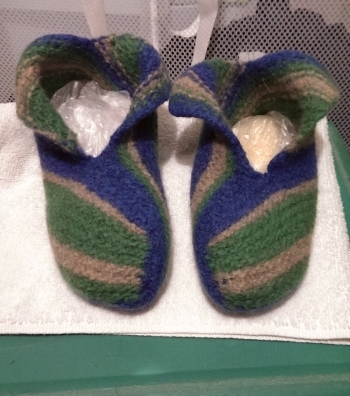 They are coated with some magic material that allows them to be thrown in the washer and dryer. Pretty cool stuff, which I like for baby and kids knits, because it's just easier. One thing I've learned with superwash, though, is that the object will grow a bit because the fibers don't grab each other as much, so after wearing your hat or socks or whatever, you might find it's loose on you. It will tighten back up after washing and drying, but this quality is unique to superwash wools only. Just a little tip if you are handwashing and lying flat to dry: your hat might fit a melon after a while! Regular wool that isn't superwash can be washed by hand, which isn't too big a deal. I use Soak or Eucalin, which comes in nice scents. Just fill a bowl with lukewarm water, add a cap of the wash, wet the item and let it soak for 20 minutes, then rinse once in the same temperature water (no agitation or wringing). I lay it out flat to dry, or shape it over a bowl or styrofoam head (doesn't everyone have one of those?). Washing doesn't need to happen very often for hats or outerwear, as dirt doesn't penetrate. I will let things hang outside to air out occasionally, and that is always nice. So, yes, wool is a pleasure to knit, a pleasure to wear, lovely, and practical. If you look at my Etsy shop, you will see that I often use at least some wool content in the things I make. And oh, don't get me started on Alpaca: yum! Any thoughts or questions about wool? Feel free to share in the comments! Is everyone as addicted to Podcasts as I am? There are humorous, newsy, strange, and wonderful Podcasts posted every day. I love RadioLab, Wait Wait Don't Tell Me, Freakonomics, but my most favorite are the knitting Podcasts. Each one different and unique, yet lovely in its own way...just like podcasts! Knitmore Girls This podcast is always entertaining and informative. Gigi and Jasmin, a mother and daughter team, talk knitting, spinning, and life. My favorite part is the focus on new challenges and laughing about mistakes. Knitting Pipeline Paula is a knitter and designer living in Illinois who is also bagpipe player and nature lover. Some others that I like to listen to are Commuter Knitter, Just One More Row, Down Cellar Studio, Twinset Designs, and a videocast called Geeky Girls Knit. Lots of entertainment while walking, washing dishes, or knitting late at night. Even if you don't love knitting, there has to be a podcast about something that you'd love to listen to! A Knit Along is also known as a KAL, and a Crochet Along is a CAL (both pronounced the same way!). There are even things called KAL CALs where a person can knit or crochet. I know, I know, those bicrafters are a wild bunch! I've only dabbled in crochet, myself. The shawl pattern is so pretty, and I'm excited to start. Also am working on the selfish knitting project, the Alecia Beth, that I blogged a bit about last time. I'm already on the sleeves, but I made some modifications that I'm unsure about (mainly a shorter twisted rib edging). I might rip out the bottom and redo it, but I'll wait until the sleeves are done and I try it on to decide. For the kal, you knit the same project as other people, at around the same pace (although everyone varies, and kal organizers are varied in how strict they are about kal start and finish times). There's a forum page to discuss yarn choices, get advice on challenging techniques, and show off pictures. The forum is almost always on Ravelry, which is the best Knitting and Crochet website ever. Seriously. And then there are usually prizes randomly chosen for those who participate. A great way to meet lots of talented knitters, too. I'll show a picture here, too, later on as I progress with the Sister Bay Shawl. There's a secret language to knitting. The lovely and descriptive words and phrases: knit, purl, knit two together, pass slipped stitch over. There are also the phrases and slang that you have to google the first time you see them: WIP (work in progress), FO (finished object), UFO (unfinished object), knitworthy (woe to you if you prove to be not!). Selfish knitting reflects the fact that knitters often make something lovingly unique and customized and perfect for someone they know. And, occasionally that someone is the knitter herself or himself! This week, my plans have been on baby knits (I will wait until these things are gifted to post links or pictures, but there sure are a lot of fun baby things to make!). And I've been working on the above cardigan for me, the Alecia Beth by Justyna Lorkowska. It is gorgeous, in a handdyed yard by Madeline Tosh (Pashmina in the colorway baltic). It will have 3/4 length sleeves, and a neckline and button band with lots of buttons (either 12 or 15) down the front. Enjoyable to knit, but slow because the yarn is thin. Looking forward to wearing it when it's all done! When I started knitting, I didn't know that Wisconsin had such a rich and valuable knitting history. A lot of that comes from one Elizabeth Zimmermann. She has often been called a knitting genius, with good reason. Her designs are still startling and unique, and she "unvented" many new techniques, such as the i-cord (idiot cord). She was also funny, wry, and encouraging, especially encouraging knitters to be thinking knitters and not blind followers with patterns. Baby Surprise Jacket, a very fun pattern. Knitting this is an exercise in trust that's been amazing knitters for years! Her daughter and grandson now continue the business she started: Schoolhouse Press. They publish valuable knitting books to keep unique techniques accessible, sell gorgeous yarns, and continue to design and publish patterns. My knitting dream some day is to go to one of their summer knitting workshops. ahhh, maybe when the kids are grown! There are also knitting connections here in Door County! I've used homegrown yarn from Nora Ahlen's Homestead Sheep and Fiber Products. Not only does she spin and dye her yarn, she also raises the sheep and trains (and competes with) the dogs who herd the sheep, along with her husband Jim. The entire extent of my knowledge on that subject comes from the movie Babe, but I still greatly appreciate her talent and skill! She does not have a website, but enjoys when people call and come to visit her for yarn. I got to meet the sheep that donated the wool that I bought. That was pretty darn cool. There's a Door County Shepherds Market in May that I've attended the last two years, and has been a wonderful source of yarn and lovely finished objects. There are even patterns for sale that celebrate Door County! Sister Bay, Ellison Bay, and Gill's Rock are all names of gorgeous shawls designed by Paula Emons-Fuessle from Washington, Illinois, who enjoys visiting Door County. I listen to Paula on Knitting Pipeline, her audio podcast, which celebrates knitting, nature, and music. I really need to make a Sister Bay one of these days! So, I feel like I am in the right place and the right time to knit, create, and connect with the wonderful knitters of Wisconsin! Did I miss any more connections that you know about? Feel free to share in the comments. I am pretty tired. What a busy and kinda crazy 4th of July! So many people up here in Door County, and the weather is amazing: in the 70's with a light breeze and sunny. Everyone seems to have their own backyard fireworks, echoing off the water, so I probably will be up for a little while. On the knitting front, I finished a gorgeous hat today, my own design using hand-dyed wool from Manos del Uruguay (Maxima in the Fire colorway) and a complimentary gold color (Cascade 220 goldenrod). I used a stranded stitch pattern from Alice Starmore, an Eastern horizontal repeat. Close up of my new hat, one of a kind! Yes, it's a knitting selfie. Deal with it. A friend of mine posted that it looked like spaghetti. She is completely right. Maybe I should have whipped up a meatball repeat hat right on the spot. Oh, well.